በጣጣም ያሳዝናል! አምላከ ቅዱሳን ነፍሳቸውን ይማርልን! ይሄ ደግሞ ምን መልዕክት ይኖረው ይሆን? LEBETE CHRSTIAN TALAK ZENA NEW TALAKU BETE METSEHAFT TEKATELE ! May God rest in peace. God has a meassege for all of us. May God rest in peace.All should focus on this meassege. 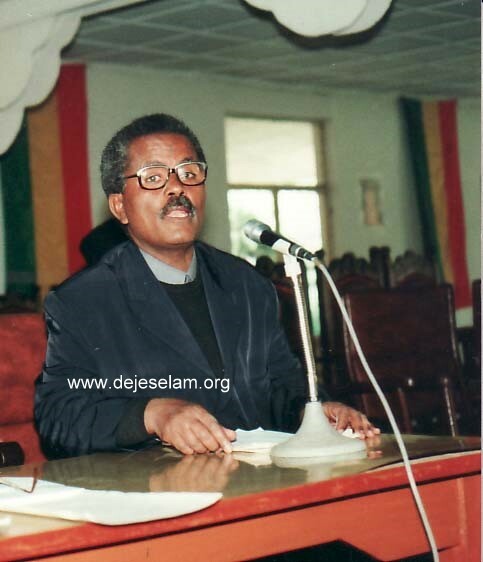 በጣም ያሳዝናል:: ምናለ ይቅር ለእግዚአብሔር ቢባባሉ ኑሮ? qebariwochu neg beEne blew nsiha bigebu Tiru neber!!! I read somewhere here posted by someone that stated "I wish MEGABE BILUY Seife-Sillase (መጋቤ ብሉይ ሰይፈ ሥላሴ) could humble himself by asking apology (for the sake of the peace of the church) at the last days of his life." If I am write it was posted before he died. In short according to the statement above he was highly acclaimed Ethiopian church leader. In effect the "የአባቶች የሰላምና የእርቅ ድርድር" failed because in was teaching that the two church leaders before aba paulos were not acceptable leaders and those appointed as bishops etc and not valid. It is also stated and his name tell us he is expert of the OLD Testament. He was also የሊቃውንት ጉባኤ መምሪያ ሐላፊ and yet he allowed the erecting of statue of aba paulos against an Orthodox dogma. Do we have any church teacher/leader who who has read the Gospel and the NEW Testament, who understand and preach The Lord Jesus Christ. Now, let it be clear my comment is not to be polemical ለክርክር አይደለም. ነፍሳቸውን ይማር። እንቆቅልሹ ምን ይሆን ?ለምንስ ተቃውሞ እያለ አባ ጳውሎስ በግድ ላካቸው?